The prominent Australian equine and wildlife artist is the daughter of legendary bookmaker, J. K. (Gentleman Jack) Waterhouse. Her paintings have a mystical quality, enhanced by candlelight. She feels that "horses line up waiting to be in my paintings," which is understandable, since her family has been involved in all aspects of racing; her parents owned Elizabeth Park Stud in New South Wales. 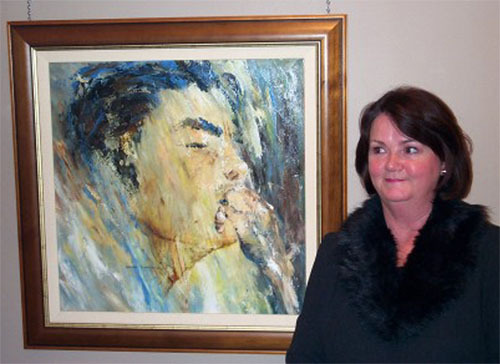 Her racing paintings have been displayed in many of Australia's leading racetracks including Rosehill, Broadmeadow and Wyong and she has painted most of the champions such as Gunsynd, Sunline and Viewed. Among her commissioned works in private collections in the U.S. are race horse and polo paintings, as well as portraits. 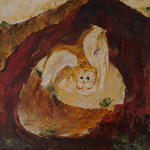 Her body of work also emphasizes wildlife, both Australian and American. During her trips to the U.S. she has traveled extensively in the West, down dirt roads & trails seeking her subjects and settings, which show a sensitivity to the culture of the "Cowboy" and Native Americans. Margaret has an Arts degree from the University of New South Wales, a Fine Art diplomas from Art Gallery of New South Wales, studied drawing at the Julian Ashton School of Art, landscape with Trish Coop, & oils with Robert Bosler. Today her works are found in collections in boardrooms, hotels and private collections in Australia, Europe, Canada, and the United States; we are honored that she has chosen to be represented in the U.S. by The Gallery at Rancho Ellenita. Margaret also specializes in commisions. These pieces are not for sale, in private collections, but serve as an example of some of her work. Small numbers of limited edition giclée prints are occasionally available of selected Margaret Waterhouse works.